A senior board member once chastised our executive team with, “You don’t trust each other enough to succeed.” We rankled at this indictment lobbed in by someone who was not part of the daily workings of our firm. It turns out, he was right. An outside observer would have noticed broken trust links in a number of the relationships in this group. Until those links were forged, we flailed. The CEO brought in an industrial psychologist to help the team, but the effort fizzled. Finally, to the credit of the CEO and board, they took action to remove the individuals who refused to set their personal differences aside in pursuit of the mission. Once the dust settled from the changes, the remaining members of the group aligned around the difficult issues of developing and implementing a bold new strategy. While we did not recognize it at the time, the subsequent two years of trial and ultimate success were pivotal moments in our careers. Whether you are CEO or a front-line supervisor, trust in some form is the difference-maker when it comes to performance. It is also one of those squishy topics that busy managers do not think about on a daily basis. Rarely is the action: “strengthen trust with and between my team members” singled out on an annual performance review or on a list of objectives. That is too bad because the trust issue should be front and center in the mind of the manager every day and in every encounter. The failure to engender trust with your co-workers, peers, and team members is a formula for stress, strife, and suboptimal results. Effective managers and great leaders recognize that building trust is a complex and sometimes slow process. They work hard at it every single day. Give your trust to get trust. Most people will move mountains to repay this simple but powerful gesture of respect. Link individual and team priorities to the firm’s strategies and goals. People thrive when they have context for their work and its importance to the bigger picture. Keep your team informed of the firm’s financial results. Whether your firm is publicly-traded or privately-held, the time you invest in explaining and talking about actual results will be greatly appreciated. Your transparency suggests you trust your team members with this important information. Redouble your efforts to understand and support the career aspirations of your team members. Nothing says “I care” more than investing time and effort in helping someone achieve a goal. Caring begets trust. Show your vulnerabilities. If you make a mistake, admit it. If you are interested in feedback on your performance, ask for it and then do something positive with the input. Make certain to loop back and thank the team members who provided constructive input. Regularly give away your authority. If you run a regular operations meeting, rotate responsibility to develop the agenda and lead the meeting. As often as possible, delegate decision-making to individuals or teams. Any action to show trust by allowing others to decide and act will strengthen their trust in you. Shine the spotlight brightly on everyone else. No one trusts the manager who constantly elbows her way to the center of the spotlight for the team’s accomplishments. Step back into the shadows and your team members will repay you many times over. Take the heat for team member mistakes. When something goes wrong, get to the center of the spotlight and keep your team members safely out of sight. Always match your words with your actions. The do must match the tell or, your credibility will suffer, and trust will fade. And yes, everyone on your team is keeping score. Beware of diluting the value of accountability. Every individual must be accountable for his or her actions and outcomes. Exceptions to this rule destroy credibility and derail your efforts to build trust. Do not let the difficult issues linger. Remember, everyone is watching you, and the clock on your credibility is running. While your team members have empathy for you in navigating the big issues, they expect you to do your job so they can do theirs. Hold team leaders accountable for building trust with and between their team members. Your team leads are a direct reflection of you as the overall leader. Teach them well and hold them accountable to the same standards you hold yourself to. Teach your teams how to talk, debate and decide. 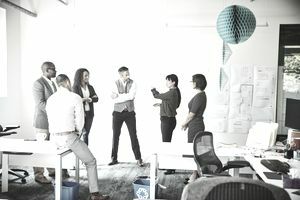 Instead of demanding easy consensus, teach your team members how to discuss alternative ideas and approaches in pursuit of the best approach. When an employee makes a mistake, encourage them to share the lessons learned. It goes double for your own mistakes. Use your errors to teach others. Always operate from a clear, visible set of values. If your firm lacks clear values, define the values that describe the aspirational and acceptable behaviors for your team members. Teach and reference the values constantly. Trust is built over time and based on many exposures. You have a thousand opportunities every single day to engender or endanger trust. Work hard to win each one of these small but important moments of trust.